FROM CLEANSING BASICS TO SCI-FI WORTHY ACTIVATION, YOUR DATA JUST WANTS TO BE LOVED. No matter what state your marketing data is in, there's always room for improvement and empowerment. Get it and get your data disciplined. 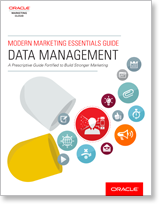 "Modern Marketing Essentials Guide to Data Management"